New year, new secure backup software version. 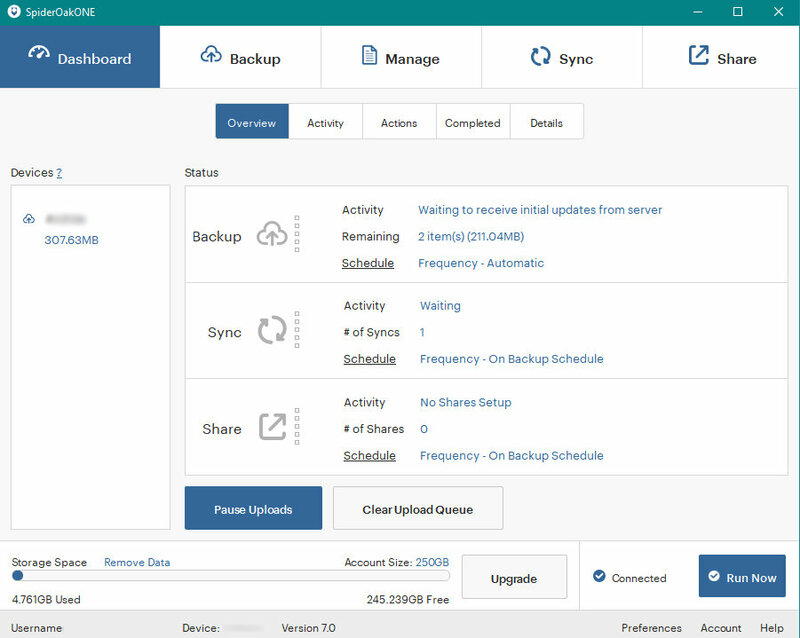 US-based SpiderOak has released a new iteration of their encrypted backup and sync software for both desktop and mobile devices. Are the changes enough to make you switch? SpiderOak Version 7.0 introduces both aesthetic changes and under-the-hood improvements. SpiderOak used to be called complex, intricate or even hard to use. The culprit? The UI or User Interface. Unlike Backblaze which only works on Windows and Mac, SpiderOak is truly cross-platform as it is one of the few backup services with a graphical client for Linux. But this universal compatibility came at the price of a consistent visual design that did not adapt to the variations of operating systems. SpiderOak looked the same across all operating systems, with its orange color theme reminding us of the default look and feel of Java apps of yesteryear. But with version 7.0, this lack of integration with your particular OS is not the case anymore. SpiderOak's new theme is all-blue, which makes it more modern-looking and improves readability. Gone are the Ubuntu-like orangey hues! While the buttons at the top keep the same function, they are now aligned. Home is now called Dashboard. On Windows, SpiderOak now allows the creation of temporary links to share your files securely right from the File Explorer. The new year also comes with a new pricing plans grid. With its $12/month 2TB plan, SpiderOak's pricing is competitive even with non-encrypted cloud storage providers of the likes of Dropbox, Google Drive and OneDrive's standard $10/month 1TB plan. You can get 15% off any SpiderOak plan by using the code VPNreviews15 during check-out! In 2017, a terabyte of data stored in SpiderOak's servers set you back $12 per month. Now for the same price you can backup up to 2TB. If you are already a SpiderOak user: good news! Your storage capacity has been doubled, for free. Changes are not limited to eye-candy, as detection of removable devices (external HDDs, USB flash drives) has been improved. This 7.0 release also bring several bug fixes, such as a correction to prevent the client from getting stuck in a "Calculations pending" state, or 0-byte files in sync. Yet the most important technical change is that the new version uses less CPU and RAM than ever before, as the encryption engine has been enhanced to better work with each specific operating system. Are these changes enough to make you switch from Dropbox or other cloud services to SpiderOak? Remember you can get a 15% discount here on any SpiderOak plan! Or if you are already a SpiderOak user, are you happy with the new interface? Tell us in the comments! Apple Removes Telegram Messenger from App Store for "inappropriate content"